We use the personal and impersonal passive to express other people`s opinions. We can use the impersonal passive to avoid mentioning the identity of the agent. We usually do this by using reporting verbs (including say, think, believe, know,etc.) preceded by the dummy subject "it" , as in : It is said that, it is thought that, etc. On the other hand, We can use the personal passive, for emphasis, to turn the object of the active sentence into the subject of the passive sentence. We put the emphasis on the subject. Example: He is said to be a businessman. 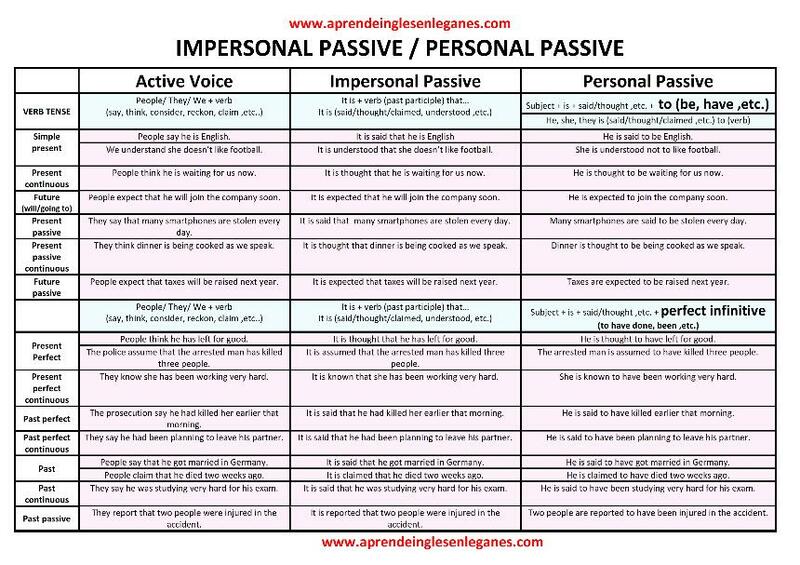 The table below will help you learn how to change from active voice into the personal or the impersonal passive. Here are some Key Word Transformation exercises on personal and impersonal passive for you to do. by clicking on the button across.